Ever since I started playing guitar over 25 years ago I can remember one thing that I always did that really seemed to help me get better. That one thing is recording my playing and listening back to see what I needed to improve on. Back then things were much different but I did have a simple cassette recorder that would allow you to just press record and then I would play into the small microphone to record my playing. It sounded pretty terrible but at least I could hear what I REALLY sounded like. Many times I think everyone thinks that they sound pretty good at a lot of things while just playing. But as soon as you start recording your playing it is an instant way to hear all the imperfections in your playing that you need to improve on. To me this is a good thing as I always want to get better. If you don’t know that you don’t sound that great in a particular area then how will you ever know that you need to improve on it? With today’s technology recording yourself has never been easier. At it’s simplest all you have to do is pick up your smartphone, find the audio recorder app and press record. So easy and sounds pretty decent! In fact I still use this all the time if I want to get an idea I have down and I’m not in the studio. But what if you want to play along with a backing track? And what if you want the quality to be a little better so you can post to Soundcloud or maybe sync the audio recording to a video you recorded then upload to YouTube. Well it’s really not that difficult but will require some learning and maybe a few tools. There are so many different devices, software, OS’s, and interfaces out there that you can use that I’m just going to recommend what I think is the best deal but will also give you a great sound. Of course I haven’t tried everything out there but I have tried this gear and it works great. 1. Computer – This could be a desktop, laptop, tablet, or even your phone. 2. 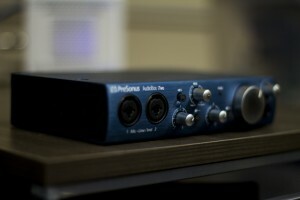 Interface – The interface that I have and recommend to many is the Presonus AudioBox iTwo. This will even connect to your tablet or phone and comes bundled with Studio One Artist software that is pretty simple to use. I use Studio One for all the backing tracks and lessons I record and have been using it for the past 3 years. If you want to import and export mp3’s then there is a paid add on that is $9.99. 3. Amp Sim – If you don’t want to mic your amp then you can simply plug your guitar directly into the AudioBox iTwo or iOne and use the Free Ampire guitar sim that it comes with. It sounds pretty good and you can hear it in the video below. 4. Maybe a Microphone – If you do choose to mic your amp then I would recommend the most used mic in recording history. The Shure SM 57. It’s durable and sounds great. If you would like to check out the Audiobox then you can find it on Amazon. If you’re not recording your guitar playing and you want to improve then you need to start doing so. Only when you record yourself and listen to the playback will you hear all the things you could be improving on. So start recording today! I was waiting for you to show how to add video to the recording. I’m interested in doing guitar covers with HQ video and audio. Everything you showed in the video is what I needed to understand about recording over a track. I want to be able to add video of me playing the song. But I don’t know how to sync video and audio. Please help! Hi John, are sure that Shure SM 57 is the best mic available for Guitar? Great post, John. Really appreciate it. It’s been used on hundreds of thousands of albums for a reason. Personally I use an AEA R84 but most people are not going to spend that kind of cash on a mic for a guitar amp. If I only had a 57 though I could make it sound really great. It’s the best bang for your buck mic out there for a reason. I want to do same but mixing a drum set. I have some good minus one tracks on mp3 I downloaded free and want to play over it while recording myself doing it then upload to Facebook or YouTube; I have been wanting to do something like that for years but do not know where to start. I have mikes for the drum set and can get a decent analog mixer Yamaha MG166CX which has a digital effect bank and even 6 channels of compressor. Playing drums over a track I do not know if I am going to need a PA powerful enough to play the track while I cover it live and then record all. How can I do it in a way that it would sound professional and which camera do I use for this? — Do I input the mix into the Audiovox iTwo? Can you help? Thanks! True, Gypsy Jazz Student completely agrees with you. Normally, all the students ask the same question about recording and they all use their smart phones, but now since you have written a detailed report on what to use and how to use. It will surely going to be beneficial for all our students.